Five years ago, we hosted the first Mikey Strong Charity Hockey Game at a rink in Middletown, NJ. What started as a local gathering has since expanded to a national stage with Prudential Center as the host, hockey legends taking to the ice, and thousands of people coming out to support my recovery and work with the Reeve Foundation. This event has exceeded my wildest dreams, but I am determined to make this year -- the fifth anniversary -- the biggest game yet! 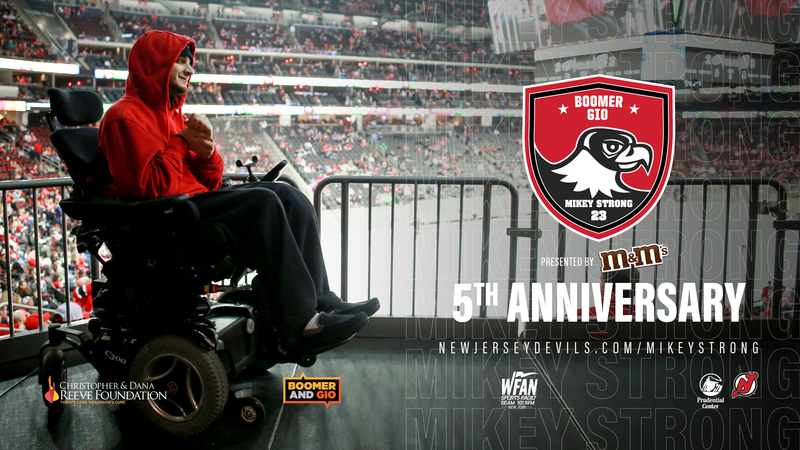 Join me for the 5-Year Anniversary of the Mikey Strong Charity Hockey Game at Prudential Center on Friday, March 22! Upon entrance with a ticket, each attendee will receive a voucher redeemable for two tickets to a 2019 New Jersey Devils game. The first 5,000 attendees to arrive on game night will also receive a voucher from the New York Yankees AND the New York Red Bulls for select games during the 2019 season. Anna, you are the reason we moved this all-star game to a bigger venue. We needed more room for supporters who love hockey and believe in my dream that someday soon, I will get back on the ice and join my teammates. If you are unable to attend, please consider making a donation to the Reeve Foundation. My goal is to raise $100,000 in 2019 for this incredible organization. From the moment I was injured, the Reeve Foundation was by my side so it is time to pay it forward and help others. And, every dollar raised gets us closer to my ultimate dream -- cures for spinal cord injury. Hope to see you at the Prudential Center on March 22.